There are two options when entering a new product, stock or labour item into Workshop Software. First Option - You can enter the product item through the Products listing. .
Second option - You can enter the product item directly onto a customer invoice, supplier stock order or supplier invoice using a quick entry feature. This option requires you to go into the product at some point after adding it to the invoice, to enter in any other details you have on the product. 1. On the left hand side options, click on Products and click the + next to the product search bar (See red arrows below). 2. The only required field in this section is Item Code, however, the more information you input about this product the easier it will be to search. You can also revisit the product at a later date and enter more details in then. NOTE: For Type, please view this article to determine what product type to select for each product: Product Types. You are also able to enter a product for the first time either via a customer invoice, supplier stock order or supplier invoice. 1. In customer invoice, click the + to add a product into the invoice. Enter the item code under product and click More/ Add Products button. 2. The below Create Product box will pop up - you are only required to enter in Item Code (which should already be populated). Item Code - The only required field. Description - Description of the product you added (will show up on customer invoice). Description 2 - This is an internal field and will not show up on a customers invoice. 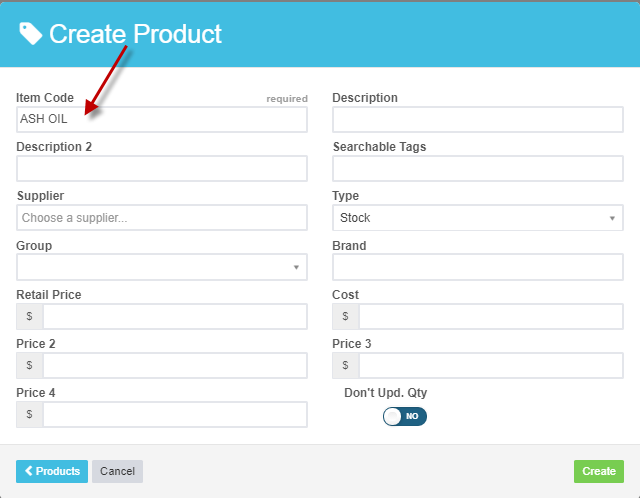 Searchable Tags - This field is useful if the product has a different item code with a different supplier which you can enter here and search for either the Item Code or Searchable Tag to bring up the same product. Group - Allow you to stocktake by group - making it easier to keep track of smaller stock items. You can add a product to an existing group or create a new group. Type - Select what type of product this product is. See Product Types . Service - Choose Yes or No. If the product is a labour service then set to YES. Supplier - Enter the supplier of the product. This will link the product to the supplier in your list of suppliers. Brand - Brand of Product. Location - Where you store this product if multiple are on hand. Qty On Hand - How much of that product do you currently have on hand. Minimum - The minimum amount of this product you should have on hand. Maximum - The maximum amount of this product you should have on hand. Don't Upd. Qty - If you don't wish to track the quantity of a product, set to YES. If you do wish to keep track of the quantity of a product, leave as NO. Retail Price - The price you will charge customers for this product. GST Free - If you wish the product to be charged excluding GST, change to YES. Price2, Price3 & Price4 - Can be allocated to customers through their Customer Details. This enables you to offer trade or reduced pricing. Cost - The price you paid for the product, or the labour cost. Comment - Anything entered in this field will sit as a comment below the product line on an invoice. The customer WILL see this. Job Card Comment - Anything entered in this field will sit as a comment below the product line on a job card. The customer WON't see this.